How to program garage door opener remotes with the Learn button? 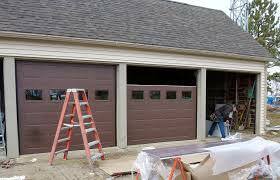 Programming your new garage door remote and clearing current remotes from the opener depends on the garage door system model. A Learn button is there in all the garage door openers. Remove the light cover on the garage door opener. Hold the learn button until the indicator light blinks on the opener. While the indicator light blinks, press your remote button. Test the new garage door remote by pressing once to see if the garage door moves. Erasing the old garage door remote is done by pressing the learn button until the indicator light stops blinking. When it stops blinking, press the remote button down and release. How to program garage door opener remotes that have code switches? In the garage doors having code switches, the code switches have to match. This means that they have to be in the same position. Press and hold the two Homelink buttons on the outside. When the indicator button begins flash rapidly then release buttons. Some vehicles may require ignition to be on during the process. Hold the end of remote control 1-3 inches from Homelink surface. Press both the buttons of the hand-held transmitter and designated Homelink button- releasing both the buttons only when the indicator light changes from a slow to rapid blink. Now press the SMART or LEARN button on the Raynor opener for 1 second and release. Return to the vehicle and firmly press the programmed Homelink button 2 times. (Hold for 2 seconds on each press). The garage door opener should be activated when you press the Homelink button second time.